In honor of the greatest create-a-character in Horrible Night history, we do not take our relationships with video game characters lightly. This new character stole the show. Sorry to those who chose Private Wyatt, but Fergus is the man. He manages to be the biggest fan of Blazko (the player), while at the same time he’s the only one to put him into his place. Fergus is fearless from the start and recognizes that everyone has a role in the war. He’s the only one who outwardly recognizes both how awesome the feats you accomplish are and how lucky everyone you are to survive them. We weren’t worried about failing to save the world as much as we were worried about letting down Fergus. 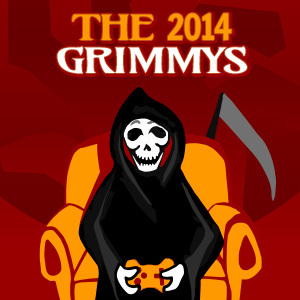 Five Days of The 2014 Grimmys are coming your way this week.